Easy? ENOUGH! 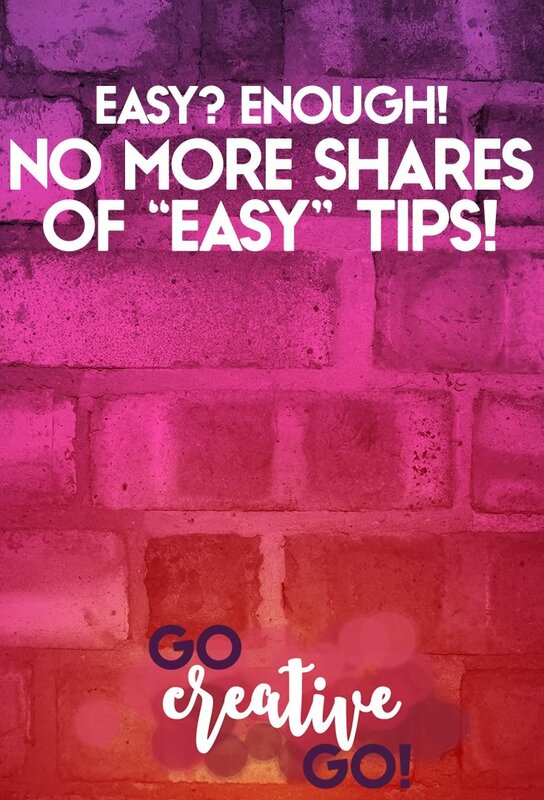 No More Shares If Easy Is Your Mantra! - Go Creative Go! It’s just past 6 AM on a rainy morning. I’m still damp and chilled from taking the dog out almost an hour ago. I’m in the middle of my first cup of coffee and I’m fighting off a headache. What’s with the detailed sharing of my morning mood? I’m going to go on a bit of a rant and I wanted to set the stage. Today’s publish isn’t of the TGIF variety, and I thought it best to warn anyone. Though, I’m guessing the title and featured image was your first warning! I have several feeds I check daily – okay, several times daily – in order to curate and share the best content. I have numerous sub-feeds set up in Feedly so that I can share to Twitter, Pinterest, Google+ and more. I’m also a Triberr member, which provides me access to even more well-written articles. And, last but not least, I follow quite a few blogs and sites with BLOGLOVIN’, mostly for pinning and visual marketing purposes. My motto for content curation and sharing? Share the GOOD stuff. It doesn’t matter if you’re a big name or a just starting out small-timer. If the content is good it gets shared. If it’s got a powerfully pinnable image attached, it probably gets shared twice or more. I’m thinking it’s time to clear out a few culprits, though. Every day, often several times each day, I’m finding easy in the titles and introductions of many a read filling my feed. And I’ve just about had enough. Easy Is As Bad – If Not Worse – As Busy! For too long busy has been the buzzword bandied about to make ourselves look/feel like a small biz success story. I’ve already lamented it’s lame overuse and abuse. It appears that easy is now the go-to, quick to click, buzz word. Okay, I got a little crazy as the list went on. Creative license. i was trying to make a point. If you’ve never done it before, it’s not going to be easy – no matter how many gurus or ninjas publish platitudes stating otherwise. I’ve designed LOTS of websites. Guess what? It’s never been easy. Same goes for any branding packages I’ve created over the years, and there have been many. Certainly some jobs are easier than others. Don’t mistake easier for ABSOLUTELY easy. That’s a mistake! I find design easier than, say … advanced mechanical engineering! Finding a task or skill to be easier than another, does not make it EASY across the board. Especially for the novice, the untrained, and those lacking expertise and time in the trenches. I wish there was a shot, an immunization, that could save us all from the epidemic that is the “easy” post. But, there isn’t. But it’s time to nip the easy clickbait calamity in the bud. It’s not going to be easy. Ha ha, see what I did there? It’s going to take an army. I’m calling it the Anti-Easy Army. I just came up with that, so it’s not like I have a lot of recruits. The purpose of this army? To ease up in the overuse and abuse of the word easy, at least as it pertains to our industry. To digital marketers, social media consultants, community managers, designers, content marketers, copywriters, etc. We will cease, starting now, sharing any article that intimates a task, tactic or practice is easy, when we know darned good and well it actually requires a lot of effort and experience. And just might be something you should hire out. Which means we have to read past the title. Easy often crops up in the body of an article. We will actively and honestly share the hard work required to do what we do, and do it well. We won’t sugarcoat the struggles, nor will we cover-up the calamities and conundrums we’ve all faced as solopreneurs and small business owners. As soon as I hit publish on this post, I’m going through my own content and carefully culling it for any misuse of easy. I’ll swap easier, if it’s suitable. If not, I’ll rework the article to ensure it isn’t an offender. Will you join the Anti-Easy army? I’ve not yet set up anything formal, but if I get enough response (leave a comment, pretty please), I’ll take action and create something more formal. Couldn’t agree more! Not just about the word easy, but about clickbait titles in general. I click on so many articles with captivating headlines only to be disappointed when the content fails to live up to the title. P.S. I just love your writing style. Your list of “easy” tasks had me chuckling. P.P.S. Filing your taxes is NOT easy. Apologies for my slow reply, Amanda. I’m neck deep in a new visual marketing product/service offering that I hope to launch by month’s end. I’m calling it a leap launch since this is a leap month in a leap year. LOL.